White, unstructured, garment washed "Dad’s Cap" with our abstract "Sea & Salt" logo on the front and "Amagansett Sea Salt Co." on the back. 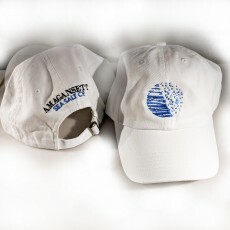 The embroidery is right into the fabric of the hat - no silkscreen printing, iron-ons, transfers or patches here! Quality-made cap with a casual soft crown, pre-curved visor, eight rows of stitching, sewn eyelets, and sliding fabric adjustment strap. These caps are tough and pretty easy to care for. We are gutsy enough to put the cap in the washing machine (we also wade into the surf on a daily basis! ), but the manufacturer recommends washing it by hand with a mild detergent in warm water. The clothes dryer is a no-no! 100% cotton fabric with rayon and polyester embroidery. Cotton covered flexible plastic bill. One size fits all.